Doing your own manicures and pedicures can save you a lot of money. You don’t have to pay a professional to do it, and you can even enjoy the relaxing task of doing it for yourself at home. If you are a professional nail stylist, then a good nail drill can help you improve your craft and increase your earnings. A nail drill machine is the idea tool for taking care of a range of tasks, helping to shape your nails and more. Finding the right nail drill machine requires some thought and some comparison of different products so that you can get the best tool for the job and for your budget. Some are designed for home use while others offer a professional grade tool that delivers quality results but might require a learning curve. Some of the factors to consider when choosing a nail drill include speed and the heads that are included, which can perform different functions. You might also want to consider whether you want a rechargeable nail drill or if you don’t mind one that needs to be plugged in for it to work. You can use your nail drill machine to shape your nails, trim your cuticles, remove dead skin and even get rid of calluses and ingrown nails. But you want a tool that does the job while also being gentle so that you can protect your hands and feet. Having lots of attachments for your nail drill machine means you can benefit from different functions. 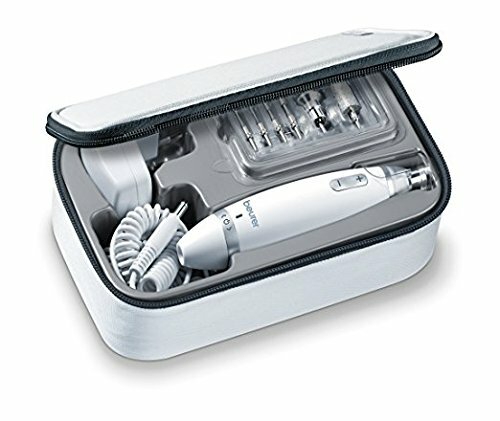 This manicure and pedicure kit from Beurer has ten attachments so you can use it in a variety of different ways. The attachments include a sapphire cone, two large coarse sapphire cones and a felt cone, a fine and a coarse sapphire wheel, four different grinders and sanding bands. Each attachment is best suited to a particular task so you can choose the one that’s best suited to whatever you want to do. The drill is easy to use and offers plenty of power for your fingernails or toenails. The integrated LED light is a highlight of this nail drill machine. Switch it on while you’re using the device for extra light and brightness so that you can see what you’re doing. The drill offers adjustable speed settings so you can control the rotations per minute and decide whether they go clockwise or anticlockwise. You can get extra replacements for the interchangeable heads whenever you need them too. Accessories with this kit include a dust shield to keep it clean, as well as a premium carrying case to hold everything together. This is an electric nail drill designed to work with 110-120v outlets, giving you the power that you need. 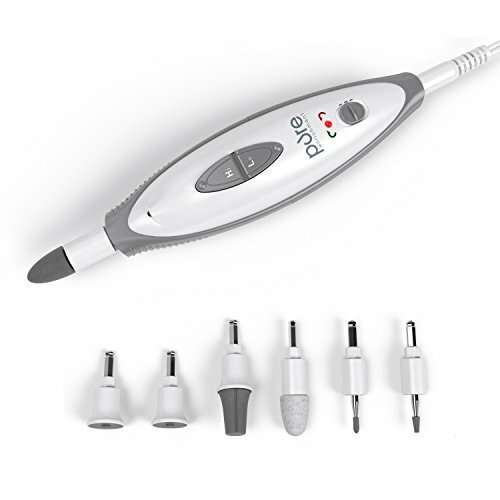 This powerful tool is great for home use and can even deliver a salon quality experience. If you’re looking for a tool that’s easy to control, this 10-in-1 tool from Utilyze is a good choice. It features innovative touch control that makes it simple to select the settings that you want. With one touch, you can select the right setting and get to work on your manicure or pedicure. It has a progressive 10-speed system, giving you the option to choose whichever speed works best for your needs. Clockwise and counterclockwise rotation is available too for even more customization. You get lots of different ways to get the experience that you’re looking for, whether it’s for you or a client. The attachments included in this kit consist of a cylindrical milling cutter and flame milling cutter, a sapphire callus sander and sapphire cone, fine and rough sapphire shaping disks and a felt polishing cone. 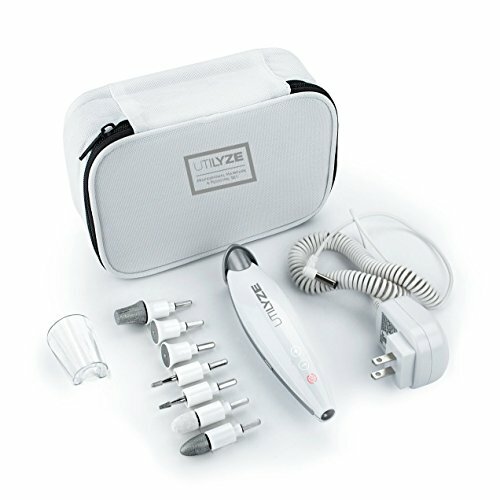 You can use all of these attachments to shape, buff, file and shine your nails, as well as shape your cuticles and smooth calluses and corns. A detachable bright cold LED light adds another benefit, giving you more light when you need it but also allowing you to remove it if you don’t require it. This is another electric nail drill machine that’s powered by a 100-240v AC adapter, so you can get maximum power from this small machine. Compared to battery-operated devices, you can get a lot more power. It comes with a detachable cover and a travel case so you can protect it when you’re not using it. Innovative touch control makes it super easy to operate. A full manicure and pedicure tools kit right at home. Tired of products that only offer one or two speeds? This product is built with a progressive 10-Speed motor so you can choose a speed that works best for you. Detachable LED light for highlighted view during use and carrying case for easy storage. Powered by a 100-240V AC Adapter that offers much more consistent power than battery operated devices. You might be thinking that some nail drill machines have too many attachments. If ten is too many, this option has seven, which still offers plenty of options. The interchangeable attachments are sapphire-coated to offer an effective action that helps to shape and smooth. You get a coarse and a fine filing disk, a sapphire cone, a felt cone, a sapphire callus rasp, a cylindrical milling cutter and a flame milling cutter. Shorten and shape your nails, get rid of dry skin and calluses and even get rid of ingrown nails using these tools. The built-in LED light helps to brighten up the area you’re working on so you can get better results. Like other models, this is powered by an AC adapter (100-240v) to give you lots of power for the two available speed settings. The long-reaching cord means that you can still work comfortably, even though the device needs to be plugged in. Choose the slower speed setting for more gentle tasks and the faster one when you need some more power. A premium vinyl carrying case is included so that you can easily transport the device and keep everything together too. It’s easy to keep everything super organized in the case and it has a firm shell to prevent damage when you’re traveling or just when you store it away. This tool is easy and effective to use, especially if you want something slightly simpler. For a professional nail drill machine, try this NATPLUS machine. It’s a multi-use machine that allows you to do everything from shaping and sanding to polishing and engraving. It’s good not just for natural nails but also for manicuring acrylic and artificial nails too. It’s designed to be low vibration, low heat and low noise, making it a pleasure to use. Not only is it a high-speed product but it’s also wireless, freeing you from any cords while still delivering power. It’s rechargeable and gives you up to 35,000RPM with two direction rotations so you can switch depending on which hand you’re using. Just two and a half hours charging this nail drill machine will give you five hours of use. It’s portable and can be used anywhere, offering a compact and light solution. You can easily hold it to use and it even has a clip so you can put it on your belt, pocket or anywhere else that’s convenient. It includes six metal nail drill bits, as well as six sanding bands. You get a large barrel, small barrel, mandrel and sanding bands, safety bit, needle head and cone to change as you wish and use for different tasks. The drill comes in a quality EVA storage bag for easy storage and transport. You also get an adapter so that you can keep it charged and get plenty of use out of it. ("Surprice" on NATPLUS NAIL TOOLS) Multi-Use Electric Nail File- Carving Engraving Routing Grinding Sharpening, Sanding Polishing Drilling Manicure Pedicure. Suitable for Manicuring Acrylic Natural or Artificial Nails. Low Vibration-Low Hea- Low Noise Save. Best Gift For Friends and Families!! High Speed and Improved Wireless E-file Drill: NATPLUS Nail Drill can reach 0-35000RPM with 2 direction-rotations for left or right-handed user (R&F) . Quiet & Smooth operation handpiece with a flexible extension. Shape hard acrylic gel nails more easily and perfect SAVING MUCH YOUR TIME. Also a better choice for salon manicure!!! 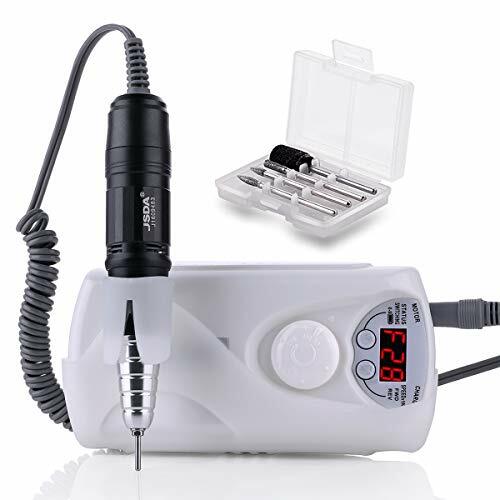 Rechargeable and Portable Drill for Nail Design: NATPLUS Nail Drill just need 2.5 hours recharge and it can work about 5 hours (DON'T USE DURING CHARGING FOR PROLONGING THE LIFETIME). Electric Nail Drill Machine of Special plastic with light weigh can be carried to everywhere with no bother of heavy and big size suitable for travel and Manicurist. Quality Assurance: All the customers can refund with no conditions within 1 months, NATPLUS Nail Drill Machine also provides 12-month warranty for quality problems and life-long maintenance services. Welcome to CONSULT all the product of us. Make sure your satisfaction. Will stop working if overload， just turn off and turn on again！Welcome! May you are always pretty. This nail drill machine offers you another professional option with high torque and high speed. You can use it for natural nails, acrylics, builder gel, dip powder nails and more because it’s strong and fast, with a variable speed range. You can choose a speed from 3,000 to 30,000RPM. Even though it’s powerful, it’s also low-noise and won’t get too hot or vibrate too much either. You should get 800 hours of use out of the high-speed bearing and high-performance accessories, which is double that of many other devices. It also features an overland protective system to prolong its life. This nail drill is rechargeable and it displays the percentage of remaining battery on its LED screen. When a number 9 is showing, it’s fully charged and lower numbers mean that it’s not fully charged. You can put the device in forward or reverse and easily control the speed that you’re looking for with the dustproof control knob. This portable nail drill can clip onto your pocket or belt, making it easy to carry around a salon or use for mobile nail tech services. It comes with a drill bit set to offer different functions, and you can buy a replacement set too. This powerful tool is a good professional grade option for anyone. If you’re choosing a nail drill machine, consider whether you want a corded or a cordless, rechargeable device. You can still get power from a rechargeable device, but you have to remember to recharge it if you want to be able to use it whenever you want. Professional standard nail drill machines can take on anything, but some people might feel like they want something designed for home use instead. Enter code 2018BCBC & Clip Coupon Save $11-Limited Time High Torque: Japanese Branded High Speed Bearing makes the handpiece Smooth and High Precision-High torque with 0.02mm coaxality Max. And this electric nail file is strong enough for natural nails, acrylics, builder gel, dip powder nails as well as the old pet nails becuase it has a wide range of variable speed from 3000-30000 RPM. Upgrade Handpiece -Low Heat,Super Low Noise Low Vibration: All the hardware accessories of handpiece are produced by high cost and high quality metal lathe，which makes the it super low noise and low vibration experience. Quality Assurance:JSDA is our Factory, each one of Makartt Nail Drill Machine comes with 6-Month money back guarantee or return service without any reason. We also provide 12-month warranty for quality problems and life-long maintenance. Long time use: The Japanese Branded High Speed Bearing and high performance accessories makes the continuous service time of the electric nail file reaching to 800 hours,2-4 times comparing to the usual handpiece. What's more This overload Protective System can prolong the service life. This rechargeable nail drill is equipped with LED Display and dustproof control knob，so that you can see the adjustable speed clearly, what is more ,with the battery display,you can Easy to know about when to charge the nail drill.